US/Corporate America’s president, Barack Obama, has a wide resume. He holds Wall St. interests dear to his heart, as shown by his nomination of Penny Pritzker, the Hilton millionaire, for Commerce Secretary, Jack Lew of Citigroup for Secretary or the Treasury… Need we say more? Then there is the oil, coal and nuclear connected Ernie Moniz as Energy Secretary. And then there is Monsanto. 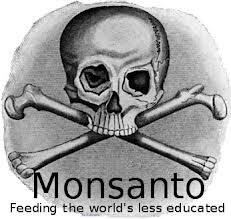 According to the same article, two of Obama’s biggest backers – Bill Gates and George Soros – bought 1.4 million shares of Monsanto in 2010. Obama’s protection of the criminal Monsanto is also leading to increased world tensions. According to this article, there have been diplomatic clashes between the Obama administration and that of Russia’s Putin over exactly this issue. In particular, this concerns the collapse of the world’s honey bee population. It is widely thought that this collapse is at least partly due to the use of a type of pesticide called neonicotinoids. These pesticides are chemically similar to nicotine, and were first introduced because they were not shown to be harmful to mammals. However, their effect on insects, birds and fish is a different matter.